In 1962, a group of Irish musicians formed a band called The Chieftains that would specialize in traditional music. Now fifty years later, The Chieftains are a six-time Grammy award winning group that has popularized traditional Irish music around the world. The band’s name came from the book Death of a Chieftain, written by our poet John Montague. Paddy Moloney, the Chieftain’s front man and only original member still in the band, first met Montague in the late 1960’s. 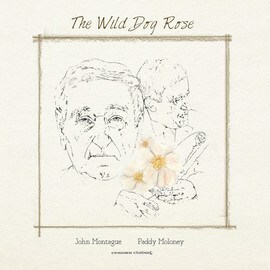 Moloney was working for Irish recording label Claddagh Records and co-produced a recording of Montague’s poems. Since they met, Moloney and Montague have talked about creating an album together- the moving poetry of Montague accompanied by Moloney’s Irish melodies. Forty-five years since they met, the pair finally recorded and released this album, which they called The Wild Dog Rose. In December of last year, The Wild Dog Rose was recorded Claddagh Records and released to iTunes. It consists primarily of Montague reading his own poetry and original music by Moloney on the Uilleann pipes and tin whistle. Other Chieftain members Kevin Conneff, Sean Keane, and Matt Molloy, are also featured on the album along with Triona Marshall, Sir James Galway and Irish pianist Veronica McSwiney. The album is a nod to Irish art and tradition and is comprised of a captivating combination of irish language, history, and music.